Ancient Indian architecture: Ancient Indian architecture is not only world famous but also present since various civilisation that took place in India. At different level different architecture came into existence and fine tuning the previous architecture. Every architecture includes various feelings, emotions of people. Sometimes various monuments were built in the memory of the loved one like the Taj Mahal or sometimes built in war memory like India gate. Three words that can describe the ancient Indian architecture are the beauty, mathematical equations and mind blowing work. Indus valley civilisation period can be called as a very matured and intelligent period. The extensive town planning, the water drainage system gives evidence of the architectural mind of the people. It can be said that it is the most remarkable feature of this period. Some of the most imposing buildings during this period are the great bath at Mohenjo-Daro and the granary complex. This was intelligently constructed with air ducts and platforms divided into units. Some of the important places of Harappan civilisation can be found in Gujarat, Rajasthan, Uttar Pradesh and Haryana. During the Buddhists period architecture was slightly different and more matured. There were three kinds of Buddhists architecture the stupas, monasteries and places of worship like temples, churches etc. With the development of different religions like Buddhism, Jainism and Hinduism the architecture became a predominant part in construction of temples. Many of these stupas, temples have become a tourist destination places in India. Rock cut architecture and cave architecture became more predominant during the rise of different religions like Buddhism and Jainism. They are the most beautiful and spectacular piece of architecture during ancient period. Some important rock cut structures are chaityas, Viharas and temples. Ajanta cave is another important and magnificent piece of work during the Buddhist period. It dates back to 2nd century BC. Ajanta caves consists of prayer halls and different ancient monasteries of Buddhists traditions. The temple is carved on a 250ft wall of a rock. The paintings on the wall of the rock depict the birth and life history of Lord Buddha. Some other fames cave architecture is found in elephant cave, Ellora caves and in some places in Karnataka. Gradually the architecture improved during the Mauryan period. Finest piece of architecture can be found during the Mauryan period. Chandragupta built many temples and palaces with wood which are perished now. 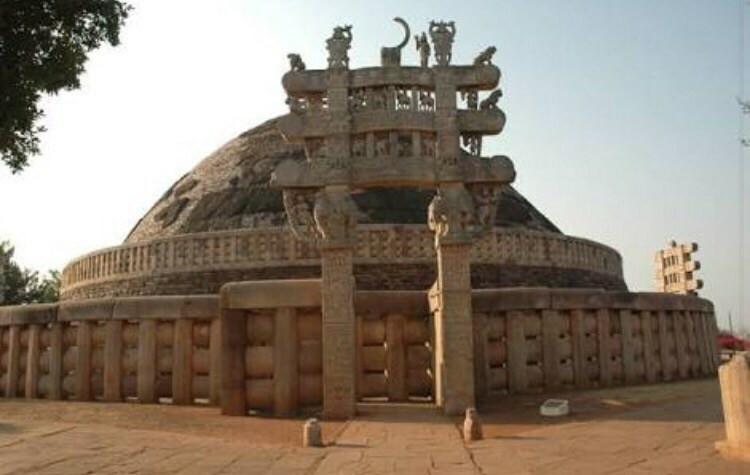 Ashoka who became a staunch follower of Buddhism built many stupas scattered over the country. The famous ashoka’s rock edict at Dauli depicts his conversion to Buddhism after the kalinga war. It has a sculpted elephant at the top. Some other important architecture which are a very important tourist destination even to this date are the cave architecture at Nagarjuna hill caves, the Sudama caves, Barabara hill caves in northern part of Gaya. The most splendid and outstanding architecture during Asoka’s period is the Asokan pillar. As the ruling changed from one dynasty to another even the architecture was improved and became more interesting. The architecture in South India was divided into Dravidian style of Tamil Nadu and Vesara style in Karnataka. The temple architecture was different and it had huge gopuras on which beautiful carving of God was made. With Gupta period and during the Mughal period architecture reached at its peak. The Mughal architecture is world famous and the most famous is the Taj Mahal in India. Every dynasty had its own unique style of architecture which can be cleared understood now from the monuments built during the ancient period.